Wastrel, rebel, layabout…just a few of the names Lord Becconsall has hidden his quick intellect and sharp wit behind over the years. Recently titled, ex-military and required to wed, Jack views ton ladies with a cynical eye… Until he falls upon–quite literally–Lady Harriet Inskip. Brides for Bachelors Eligible rakes walk down the aisle! 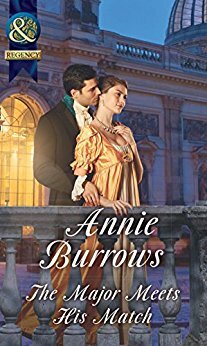 This is the first book that I have read by Annie Burrows and it won't be the last, I really enjoyed reading this book and I can highly recommend this book. I am looking forward to reading the next book in the series. I found this book had a lot of humour and sometimes the story could pull at your heart strings, (well it did for me). As with all my reviews I will talk a little of the characters. Lady Harriet is a woman who as been brought up differently to girls of the same class as herself, when in the country Harriet likes nothing better that riding her horse and wearing some of her brothers clothes, her parents have there own interests her mother likes everything to do with science and cannot be bothered with running a house so Harriet is the one who makes sure the family home is running well, her father is busy making sure that her brother's know how the estate is been run. So if it wasn't for Harriet's Aunt Susan and sponsoring her come out with her cousin Kitty, Harriet would never have seen London but the town isn't what Harriet thought it would be until she meets Lord Becconsall but at the time of the meeting she only knows him as Ulysses. So this a good time to introduce Ulysses or Jack Hesketh but to give him is proper title Lord Becconsall, who was a major in the army and has recently come into the title. Jack has three other friends. Lord Rawcliffe = Zeus, Captain Bretherton = Atlas and Thomas Kellett = Archie. These friends have known each other since they were at school, but then they separated and they got back together to celebrate the return of Jack, were he fell from his horse a little worse for ware and this is how Harriet and Jack met. I found Jack to be funny and loyal, he was always on Harriet's side and unbeknown to him was slowly falling in love with her. Like Harriet, Jack was the youngest and again forgotten son and he should never have inherited the title but his two older brothers had died. Also Jack and his friends have a wager Jack is determined to prove to Zeus that Harriet is a proper lady. (I will dare anyone not to laugh when the wager is revelled). So from here I won't reveal much more only that Harriet knows that Jack and his friends have a wager and Harriet then needs Jack's help with proving her Aunt Susan's innocence to her Uncle Hugo. As I said before I loved the book and I'm so looking forward to reading the next book in the series. I received this ARC from the Author in return for a hinest review.